Ku-ring-gai Flying-fox Reserve, located on the lower reaches of Stoney Creek, is 15 hectares in area. Stoney Creek rises in Pymble and follows a sinuous course eastwards through the reserve, to join Rocky Creek which flows through Garigal National Park and into Middle Harbour Creek. The reserve covers both sides of Stoney Creek valley with residential development on the ridgetops above. The houses are surrounded by large gardens. Subdivision in the 1980s and 1990s led to some houses being built lower on the slopes, closer to the reserve. The high ridge to the south and the north shore ridge to the west protect the valley from the strongest of the southerly and westerly winds. The valley slopes are steep with outcrops of sandstone forming cliffs up to six metres high along some boundaries. 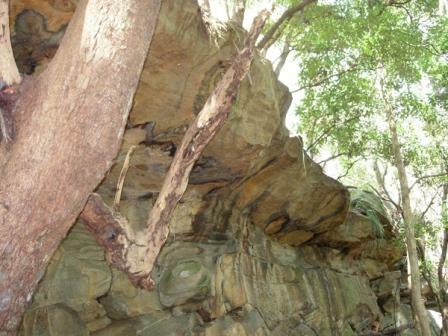 The soils on the ridges are clays from Wianamatta shale whereas toward the east and on the lower slopes the soils are sandy, formed from Hawkesbury sandstone. Vegetation on the upper slopes is tall open forest. The canopy species include Blackbutt (Eucalyptus pilularis), Turpentine (Syncarpia glomulifera), Sydney red gum (Angophora costata) and Red mahogany (Eucalyptus resinifera) in the western part of the reserve. 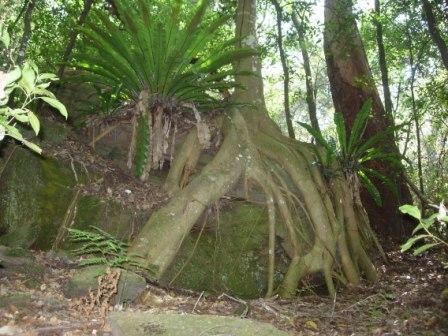 This community is classified as Turpentine Ironbark Forest (even though the Ironbarks are not present) and is listed as endangered by both NSW and Commonwealth Scientific Committees. Further east the upper slopes include Red bloodwood (Corymbia gummifera) and Sydney peppermint (Eucalyptus piperita). Closed forest dominated by Turpentine (Syncarpia glomulifera), Coachwood(Ceratopetalum apetalum), Sweet pittosporum (Pittosporum undulatum), and Lilly pilly (Syzygium spp). 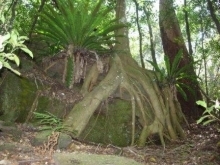 is found on the lower slopes and along the creek. Trees such as Blue gums (Eucalyptus saligna), and Blackbutt (Eucalyptus pilularis) emerge above this canopy.